Master Lock offers a variety of safety padlocks including Zenex™ Thermoplastic, aluminum, and steel. These lock body options allow you to choose the padlock that best fits your work environment. 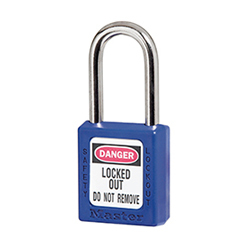 Lightweight, non-conductive lock body perfect for all safety lockout applications. Durable anodized finish is best used in caustic conditions and harsh environments. Highly visible, UV resistant finish to withstand dirty environments and outdoor applications. 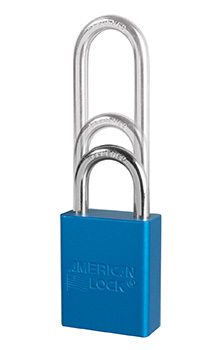 Reinforced steel padlock best suited for when locks may be subjected to physical abuse. 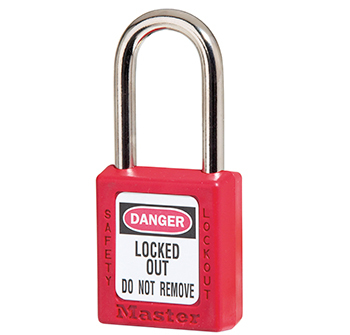 Master Lock & American Lock safety padlocks are available in a variety of colors different for easy identification and to help you meet OSHA’s 1910.47 Control of Hazardous Energy lockout standard for padlocks. The OSHA Lockout/Tagout standard outlines 5 requirements that all safety padlocks & devices must meet – Durable, Substantial, Standardized, Identifiable and Exclusive for Safety. Colored padlocks are clearly differentiated from your other devices such as security locks to meet OSHA‘s “Standardized” requirement for padlocks and also allow you to assign colors per employee, department or other to meet OSHA‘s “Identifiable” requirement. Learn more about the 5 requirements for safety padlocks. Master Lock and American Lock safety padlocks offer shackle variations on all safety padlocks in order to best fit different applications and hard to reach areas in your facility. The Master Lock and American Lock safety padlocks and shackles are manufactured with materials that withstand harsh environments to meet OSHA‘s “Durable” requirement for padlocks and the shackles provide the required strength to stand up to considerable force, when applied, to meet OSHA‘s “Substantial” requirement. Master Lock and American Lock safety padlocks provide more customization with the option of laser engraving on most safety padlocks. Laser engraving allows you to permanently identify employee information on padlocks such as employee number, employee name, department number, company name, company logo & more. Laser engraved padlocks can clearly indicate the authorized employee that applied the device to meet OSHA‘s “Identifiable” requirement for padlocks and can ensure that the padlocks are only used for controlling energy which meets OSHA‘s “Exclusive for Safety” requirement. Learn more about OSHA‘s lockout/tagout requirements. Simply fill out a laser engraving form where you choose your font, size & content and include with your padlock order. 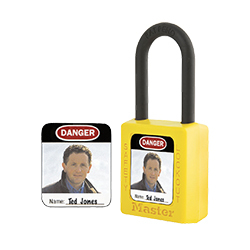 Standard for the Zenex™ thermoplastic safety lockout padlocks. The labels display “Danger: Do Not Remove” and “Property of” text with space to write in an employee‘s name, department or id number. Additional padlock labels are available for Master Lock & American safety padlocks including multi-lingual, wrap around laminated and photo ID labels. Allow on-site addition of an employees picture to easily & quickly identify the worker who applied the padlock. These labels are also helpful in workplaces where multiple languages are used or language is a general issue. Photo is applied under a layer of laminate for extra durability. 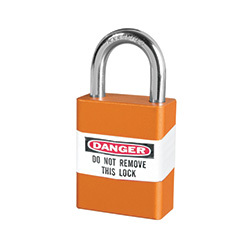 Feature “Danger; Do Not Remove This Lock” text on the front and “This Lock Belongs To” text on the front for write-on abilities. Label is applied with a protective laminate for extra durability. Padlock labels provide on-site customization ability to clearly indicate the authorized employee that applied the lock/device which meets OSHA‘s “Identifiable” requirement for padlocks. Learn more about the requirements.